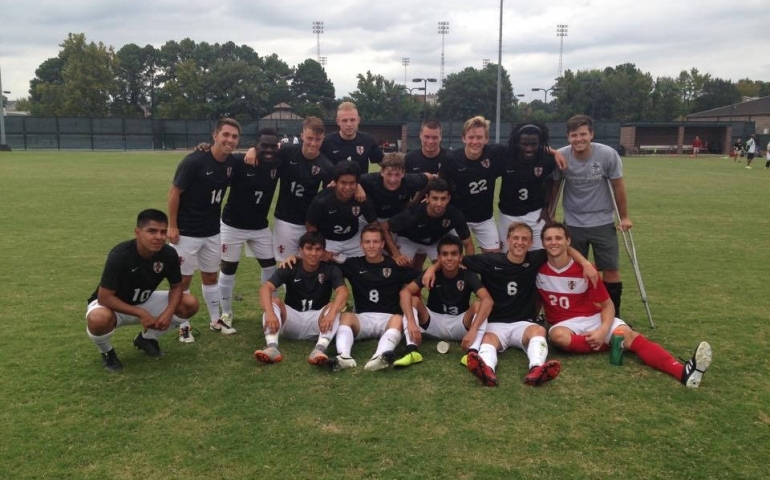 The Crimson Storm Men’s Soccer Team are a month into offseason workouts and have hit the ball rolling. In mid-January, the men’s soccer team started off the semester with futsal. Futsal is a modified form of soccer played with five players per side on a smaller court that is generally inside. It’s a high intensity, fast-paced game that requires quick thinking, but does not necessarily require high exertion. It allows the players to get maximum amount of touches on the ball in a fast-paced environment. I talked to the Great American Conference Freshman Player of the Year and All-GAC First Team midfielder, Tommy Fiszel about what it has been like since the end of last season. I also asked Fiszel about some of the goals he has for himself and the team for this offseason. Next, I caught up with Head Coach George Schroeder and asked him about some of the things he looks forward to most about soccer’s offseason. He then went on to explain what the recruiting process is like year round. I then asked Finally, I inquired about some of the things Coach Schroder enjoys doing that he doesn’t necessarily get to do during the soccer season. The men’s soccer team looks to reload this offseason and to have a big season this next fall. With veteran leadership returning, a strong group of promising underclassmen and a solid recruiting class coming in, expectations will be high for the Crimson Storm. The spring schedule has yet to be announced, but be on the lookout to catch the men’s soccer team in action towards the end of the semester.